The 4th Commandment of Enterprise is RESOLUTION! "Responsibility is the Ability to Respond"
The new revolution is the revolution of responsibility. In your planning you must become resolute in reprimanding irresponsible activity that would jeopardize standards, values and quality. 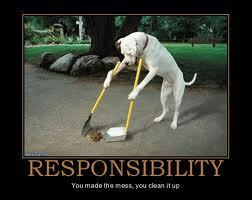 Reprimand what you require; actions of others as well as your own.